What is a Communication Matrix? It’s simple. A Communication Matrix is just an easy way to keep key players in the loop. It details things like project owners, deadlines, project status, objectives and so on. Improved communication across departments. When all elements of a project are laid out right there in a matrix document, everyone is plugged in and knows what’s going on. As a result, it’s much easier for team members in different departments to communicate and work together. More efficient use of resources. When team members can quickly identify who is doing what, they can get right to fixing an issue. That means more time correcting problems and less time trying to figure who to talk to or what the status is of a project. That’s what happens when communication channels open! Faster decision-making. Stakeholders and leaders have all the information they need at all times, so decision-making is much smoother, more efficient, and faster. If approvals are still lagging behind, you can be sure it’s for reasons on the approver’s end—not because of the communications matrix. 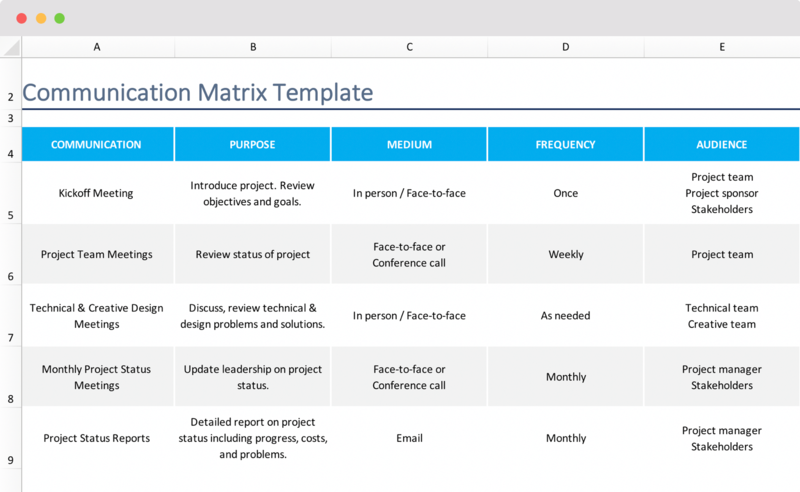 If you can open Microsoft Excel or Google Sheets, then you can easily make a Communication Matrix. It’s really just a matter of determining what are the important aspects of your project and how you want to break it down. Then, all you need to do is input your relevant information into the spreadsheet. Let’s look at some suggestions for how you might want to categorize information in your matrix. Communication: This would be things like meetings, status reports, project newsletters, etc. Purpose: What’s the purpose of the meeting or the report? Be succinct as possible. Now’s not the time to prove you’re the next Shakespeare. Medium: Is the communication going out via email, conference call, or a in person in a meeting? Frequency: Is this happening daily, weekly, monthly, or is it just a one off? Audience: Who is this going to, or who needs to be present? Owner: Who is in charge of moving this part of the project along? Is it the project manager, project sponsor or a stakeholder? Deliverable: What tangible item will be the end result of that particular part of your project? Possibilities include an agenda, a slide deck, a project schedule and a status report. Remember, this is just a template. Rework it however you want. You might want to add categories like deliverables, budget, deadlines, or project contributors. That’s completely up to you and will depend on what other factors are at play in your project. A Communication Matrix is also a useful tool to establish project approval processes—a source of frustration within many marketing teams. You can determine which projects need approval and what level of leadership is responsible for that approval. For a tactical project like a monthly newsletter, you’ll want to change the “deliverable” column to an “approval” column. The newsletter itself is the deliverable, so it’s more important here to know who has the final sign off each month. Special offer emails that impact sales goals may need a higher level of approval, maybe from someone like the VP of Sales. The frequency, of course, would be based on how often the newsletter goes out. 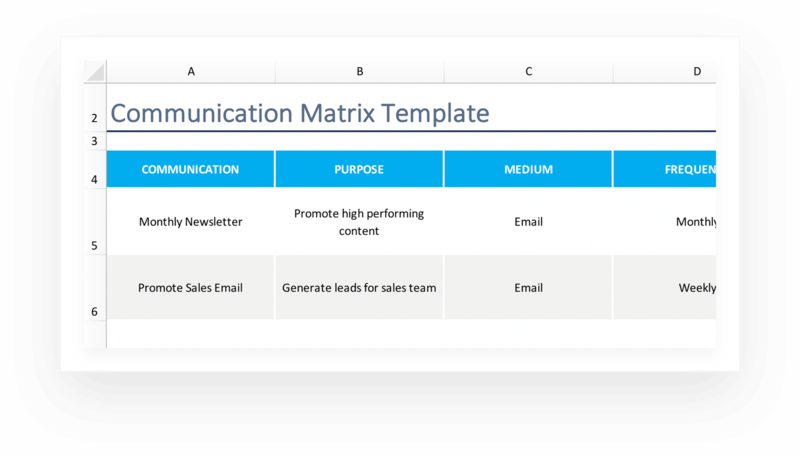 The communications matrix is great for any department, not just marketing. Any internal communications processes will be greatly improved by putting this in place. Use this walkthrough as a guide to get that process started. Now that you’re ready to rock a communications matrix, you might want to read a few other relevant resources. No need to create your own communication template. Download ours right now. No strings attached!